But as Haller prepares for the case that could launch him into the big time, he learns that Vincent's killer may be coming for him next. Enter Harry Bosch. Determined to find Vincent's killer, he is not opposed to using Haller as bait. But as danger mounts and the stakes rise, these two loners realize their only choice is to work together. Michael Connelly had already established one of the greatest characters in modern-day crime fiction, LAPD detective Hieronymous "Harry Bosch", when he pulled a swerve in the brilliant The Lincoln Lawyer (2005). He took readers on a fascinating ride alongside defense lawyer Mickey Haller, a man whose honour and soul had become part-buried under years of gaming the legal system. In several ways Bosch the cop and Haller the defense lawyer seem like total opposites, but they also share some underlying traits (eg maverick personalities who trust themselves more than the systems in which they operate, who scrabble for some sense of justice). 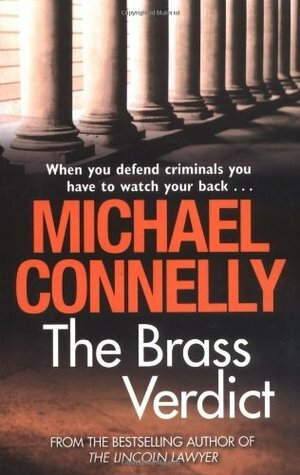 In The Brass Verdict, Connelly brings his two flawed heroes together, a tasty collision that delivers another exceptional crime tale. Last time we say Haller, he had somehow managed to find justice while acting as defense counsel for spoiled rich kid Louis Roulet, at great physical and emotional cost to himself. But rather than rising triumphant from that success and kicking on to even greater courtroom paydays, Haller had muddled along for a while, before beginning a downward spiral, sucked into a painkiller addiction and worse. He eventually went into rehab, and took a sabbatical from court work. As he's wondering whether to step back into the arena, a gift falls into his lap: an old colleague is killed, and has bequeathed to Haller his practice, including the upcoming trial of a Hollywood bigwig accused of double murder. Cha-ching for Haller's moribund finances, although the gift may be a poisoned chalice. Will Jerry Vincent's killer look to bump off the replacement lawyer, Haller, too? Meanwhile, Haller has to deal with the investigations of one of LA's finest, detective Harry Bosch, who's looking into Vincent's murder and thinks the slippery Haller might know more than he's sharing. How can Haller balance protecting his new clients' rights while trying to help the cops catch his friend's killer? While trying a the biggest case to come along in years, and try to keep himself alive in the process? 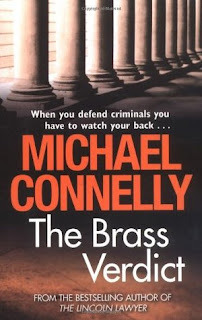 For someone who had no experience writing legal thrillers until he wrote The Lincoln Lawyer, Michael Connelly sure knows how to write an absolute cracker. The Brass Verdict is a terrific read, with a propulsive storyline that sets the pages whirring, while also providing plenty of character depth and philosophical questions too. Largely told through the eyes of Haller, we get a different take on the Harry Bosch that long-time Connelly fans think they know, while also getting a deeper look at 'the Lincoln Lawyer' as he scrambles to finagle a solution from a rusty system, and survive. For all his flaws, Haller is a family man; even if one with a broken family. His personal relationships with his ex and his daughter, along with his small cadre of close friends and staff (an overlapping group), bring to life the conflict for and within the talented lawyer. Connelly has crafted a character than on the surface would be easy to despise (a low-rent defense attorney who games the system to benefit his clients and himself), but instead is compelling, fascinating, and easy to empathise with. A terrific novel from a terrific author.